A reported 17,000 Palestinians peacefully marched in Gaza on March 30 as they made their historic demand for a right to return to their ancestral lands when they were met by Israeli Defense Forces (IDF) snipers who opened fire, killing 17 people and wounding about 1,500. 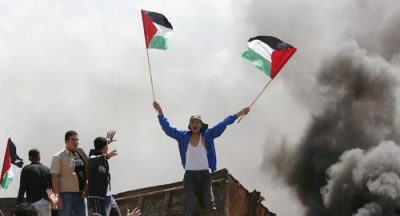 The Great Return March was the beginning of a six-week long protest that was due to end May 15, the 70th anniversary of the Nakba (catastrophe) marking the day 750,000 Palestinians were driven from their homes by the new state of Israel in 1947. The Black Alliance for Peace (BAP) condemns this and all violence carried out against the Palestinian people by the Israeli government. BAP demands an end to the occupation and the continued theft of land and resources by the Israeli government. BAP calls on the U.S. government to cease financial and military support for Israel, which makes every U.S. resident complicit in an ongoing war crime. BAP condemns the corporate media that characterized the assault as a “clash”—where one side had the power of a militarized state and the other side had nothing but unarmed men, women and children. The Israeli government continues its brazen disregard for life and even bragged about the killing in a now-deleted message posted on Twitter, proclaiming they “know where every bullet landed.” Israel has no reason to fear retribution. As a client state of the United States, it acts with complete impunity. Every gun, bullet, bomb and tank in Israel is paid for by our government. The United States uses its seat on the United Nations Security Council to protect Israel and to defend it against the international law it violates on a daily basis.